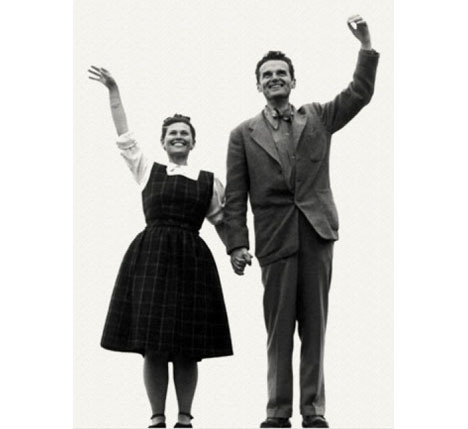 The Eames: The Architect and the Painter documentary is set to air in the U.S. on PBS next Monday the 19th, and Herman Miller has posted an attendant website intended to give viewers "an inside look at the connection between the Eames' legacy and Herman Miller's design heritage." - A visual timeline that brings to life the major milestones throughout the Eames' body of work while working with Herman Miller. Users can scroll through the timeline or jump to specific time periods by clicking on the Eames signature icons that are representative of when they were released. - A mix of photography, video and product photos are woven in with quotes and historical anecdotes about Charles and Ray, their work, and their life together. - A chance to win the classic Eames Lounge Chair and Ottoman by signing up for the giveaway. If you missed it when we originally posted it, check out the trailer here.